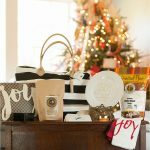 This is a HUGE giveaway…Last year in this giveaway I gave away 8 of my favorite things here at Joyful Jane to one happy winner, but this year I am giving away even MORE-13 new items in total! 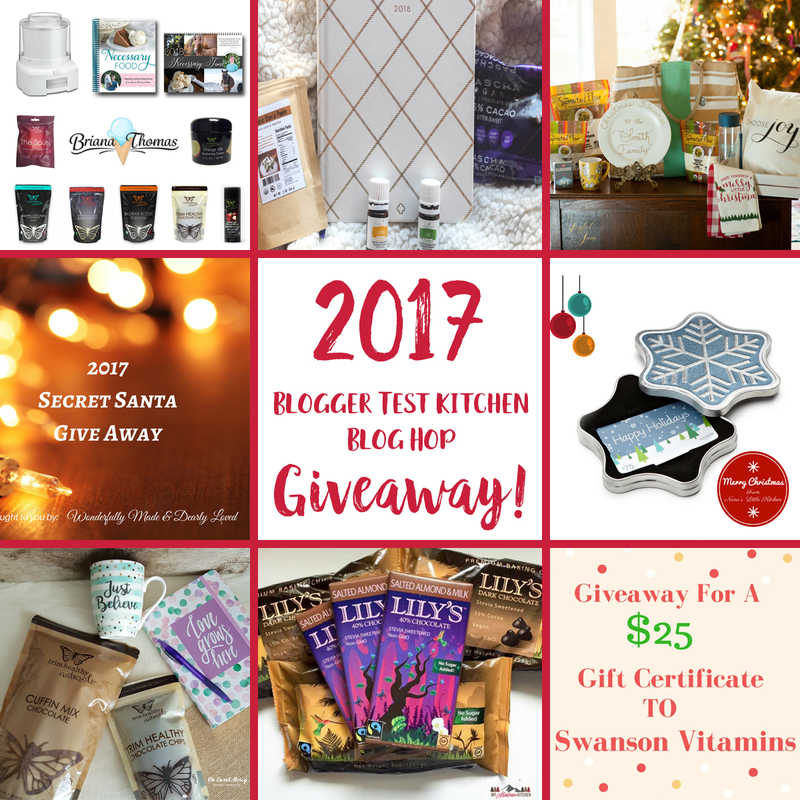 My friends at the THM Blogger Test Kitchen group on Facebook (in which I am a Blogger) are each also giving away their favorite things (see the goodies they are giving away below), so be sure to ENTER and visit the sites and you could come away with some seriously awesome prizes! Here is a list of the items in my Favorite Things Giveaway and below you will find detailed pictures and descriptions about each one! Here are the 8 bloggers that are blogging buddies of mine from the THM Blogger Test Kitchen Facebook Group and we are each having our own great giveaways in this Blog Hop, so I hope you will check out and go enter each fun giveaway (see all the great goodies from each giveaway in the pictures below and read more details about each blogger and their blog)! More giveaways means more chances to WIN! This pillow cover is a favorite of mine because of the message that is on it. I have a shirt that matches it that I wear all the time to remind me to keep my mind focused on the one who created JOY–the Lord. I made this scripture print when I began this blog and you can download a FREE copy of it HERE! So much heartache can be lessened if we will choose JOY! 2. Personalized Christmas Blessings Plate with YOUR last name of choice written by hand in my calligraphy by yours truly! This is my very favorite company to order my sprouted flour from because it is a superior product in my opinion! My bread and rolls rise higher and have a lovely fluffy texture when I use this White Whole Wheat flour! 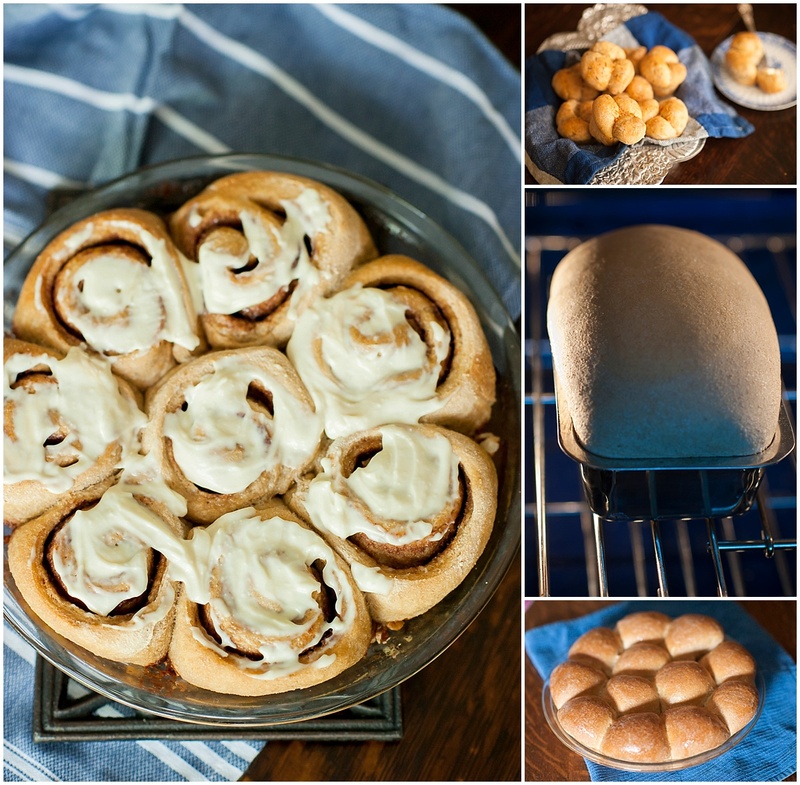 I like to make my Easy Sprouted Whole Grain and Honey Bread, my Fluffy Sprouted Rosemary Rolls with Garlic Butter, my Easy Soft Sprouted Wheat Rolls and one of my FAVORITES is my Scrumptiously Soft and Fluffy Sprouted Cinnamon Rolls that would be perfect to make for Christmas festivities! Try it out for yourself this month as the To Your Health Company is offering $1 shipping for the month of December! Pictured below are my Easy Sprouted Whole Grain and Honey Bread, my Fluffy Sprouted Rosemary Rolls with Garlic Butter, my Easy Soft Sprouted Wheat Rolls and my Scrumptiously Soft and Fluffy Sprouted Cinnamon Rolls that would be perfect to make for the holidays! 4. 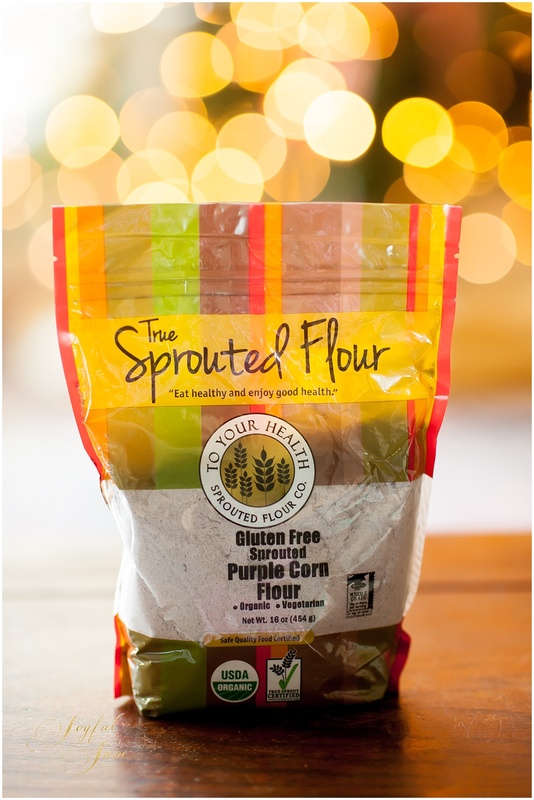 Sprouted Purple Corn Flour from the To Your Health Sprouted Flour Co.
I’m a huge fan of cornbread and purple corn flour is supposed to be really gentle on blood sugar, so it would be a great one to use if you want to try out a healthy cornbread recipe! I plan to have some cornbread recipes to share in the future, so check back on Joyful Jane for those! 5. Sprouted Yellow Corn Flour from the To Your Health Sprouted Flour Co. This is a similar product, but made with yellow corn instead of purple. This would be great to have for baking if you need to avoide grains or if you just want to make something with oat flour such as the THM Pancakes or the THM Banana Cake! 7. Monogrammed Gold, White and Turquoise Bag with YOUR monogram on it when you win! This is such a fun bag! It has shimmery gold stripes and fun details on the side of the bag. The winner will get to have their monogram embroidered on it! 8. 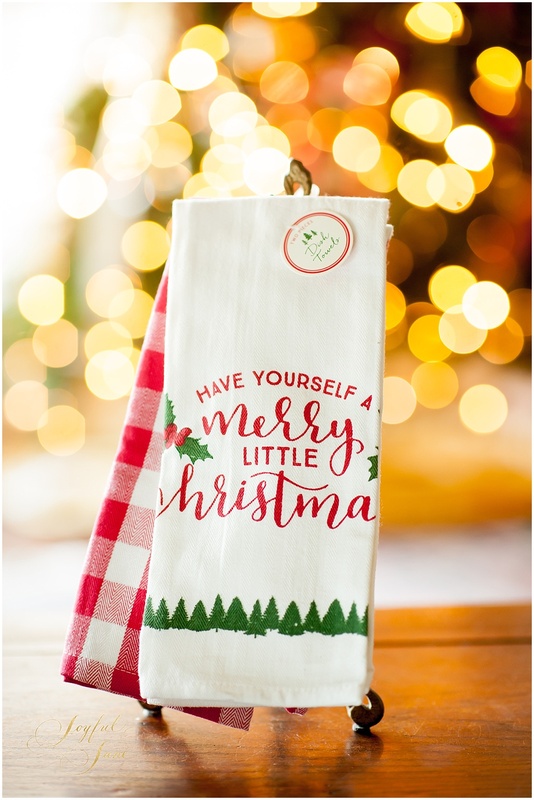 Have Yourself a Merry Little Christmas Set of two Tea Towels. This is a darling set of tea towels that is sure to make any kitchen a bit more merry! 9. 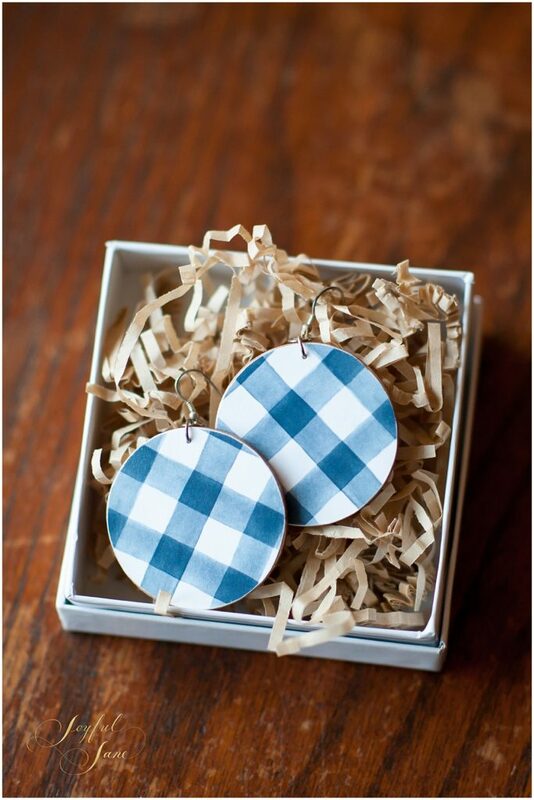 Hand Made Blue and White Checked Wooden Earrings by Katrina Westphal. If you know me well then you know how much I love blue and white! These blue and white earrings are just adorable! They are wooden and very lightweight and they are made by my sister in law. I have very talented sisters in law! Last year I featured earrings made by my sister-in-law LaDonna Gatlin and this year I am featuring earrings made by my sister-in-law Katrina Westphal. Katrina loves minimal wooden jewelry…and bursts of color. 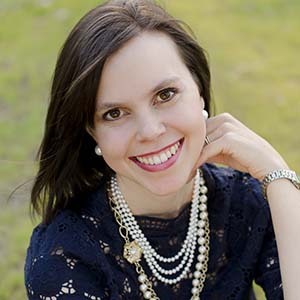 Unable to find simple, yet beautiful designs that combined the two, she began PrairieKin with the mission to make the very earrings for which she had been searching. Named after the rolling prairie of her childhood farm, PrairieKin crafts beautiful earrings out of natural, eco-friendly materials. Lovingly created by hand, these lightweight earrings will make a lovely addition to any outfit! This cheerful yellow mug is certain to brighten your day as you sip your coffee or tea! We could all use some encouragement and these little cards could bless your day! 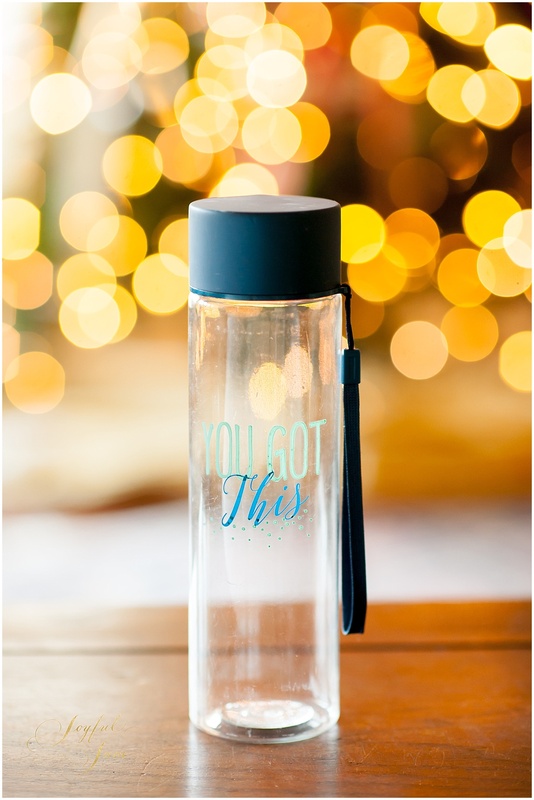 This cute water bottle should be a great reminder not only to drink more water, but to encourage that through Christ you can do all things! Here are the goodies that the 8 blogging buddies are giving away! 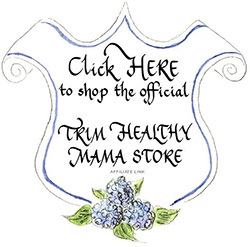 Nana’s Little Kitchen is serving up solid THM Friendly Southern dishes to help you on your Trim Healthy Mama journey. Teresia is sharing classic recipes that are satisfying, delicious, and nutritious to help you weave this fantastic diet plan into the fabric of a healthy life. Click here to enter Teresia’s giveaway and a chance to win a $75 Amazon gift card! 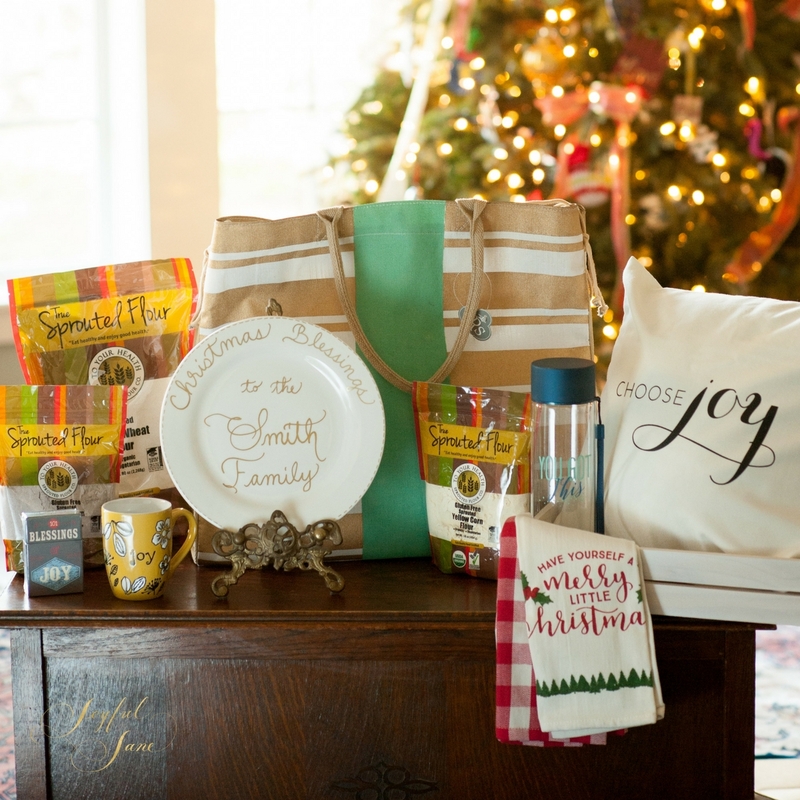 Enter Joyful Jane’s giveaway in the box below! Sprouted Flour, I’m excited to try baking with it. I would love to have the Joy pillow, it’s beautiful and a great reminder! So much kindness, Joyful Jane! Yes, I also am excited about the flours, since I’m trying to get the hang of replicating old recipes in a THM-friendly way. 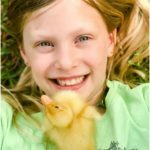 Love your Joy theme and would love to win your prizes!! 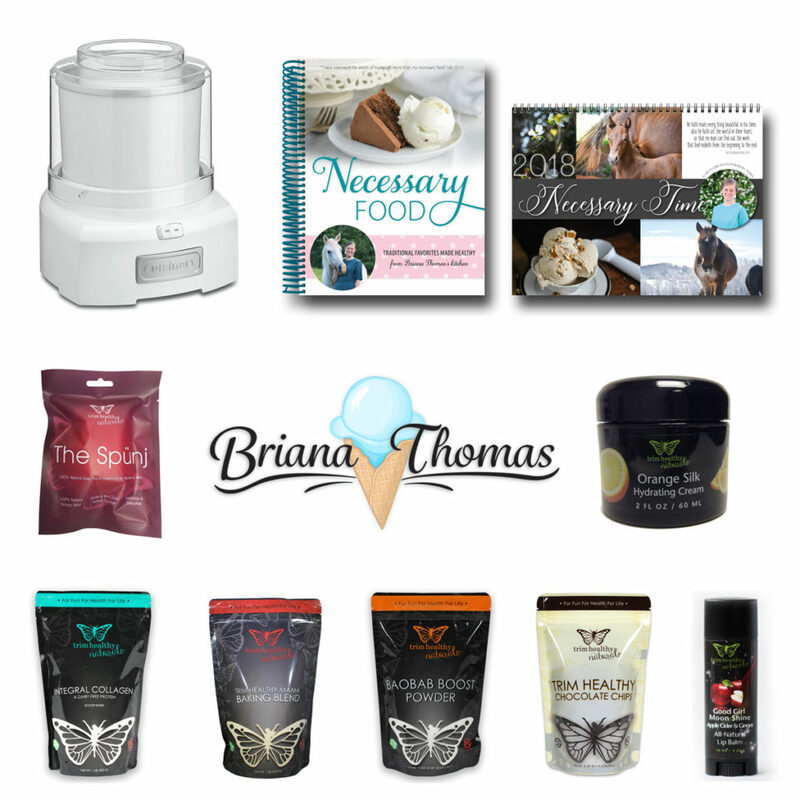 This is a very wonderful giveaway, I would be honored to win any of your products. I love reading your blog posts. I’m a sucker for bags so that’s my favorite item I’m excited to win. I would love to win this giveaway. I need to jump back on the bandwagon and lose this weight. I’m excited to try the sprouted wheat flour, and I love the monogrammed bag! I love the tote bag! It all looks neat! I like all your items, but I love the tea towel. Would look great in my kitchen. 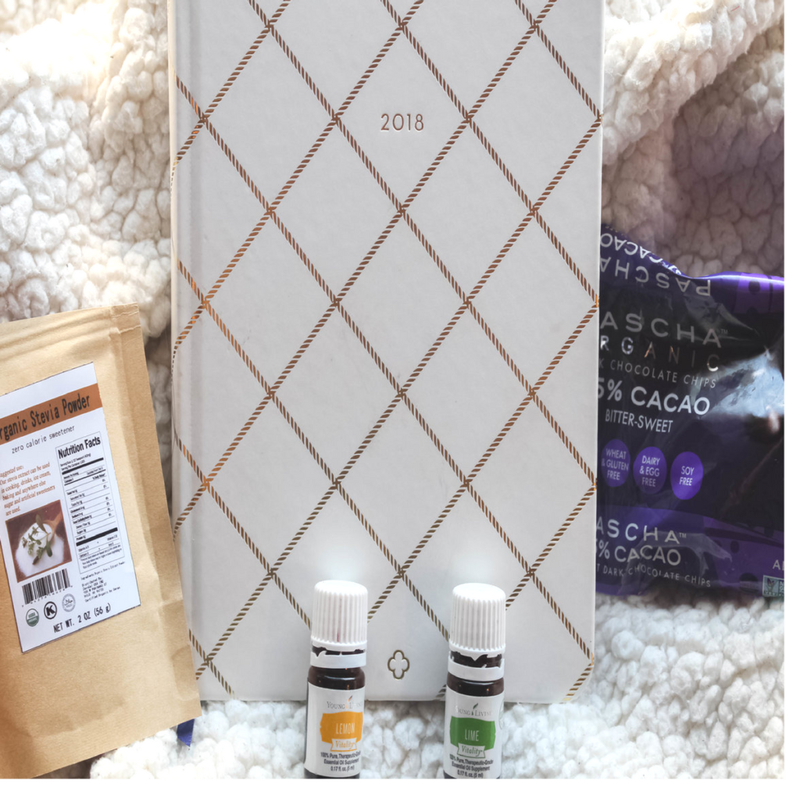 I love the bag, and just everything about this giveaway! I would love to try the flour! Baking some new items would be wonderful! I would love the Joy pillow cover. It would be a wonderful reminder every time I look at it. Thank you. I love it all! I like your style. I’m glad I’m signed up to your email list. I’ll be visiting here more often! Found your blog through Briana’s link. Looking forward to discovering more on your website and blog. Merry Christmas! The sprouted flours look amazing. I would love to try some yummy recipes with them. Merry Christmas! I am excited to try the Sprouted flours! Sprouted flour, trying for the first time. The Choose Joy pillow pillow is my favorite because it is so cheerful. The personalized Christmas plate looks beautiful! This giveaway is just gorgeous. Thank you for offering it! I would love to give all of those flours a whirl! I would be so grateful to receive any of the gifts. The striped bag caught my eye! I’ve never tried sprouted flour before, but I would love to learn to use it! Everything is so gorgeous that I can’t even decide. I really love the pillow cover and the print! The you got this water bottle is the item I’m most excited about winning because 2018 is going to be about my health. Hard to pick only one item to be a favorite choice! Great give a way! I would love to try the sprouted flour, though. I love the monogrammed bag! I am excited for the baking items and the inspirational cards. Such a great giveaway of items! Love the bag! And all the rest of the items! Appreciate all you trim healthy mamas. 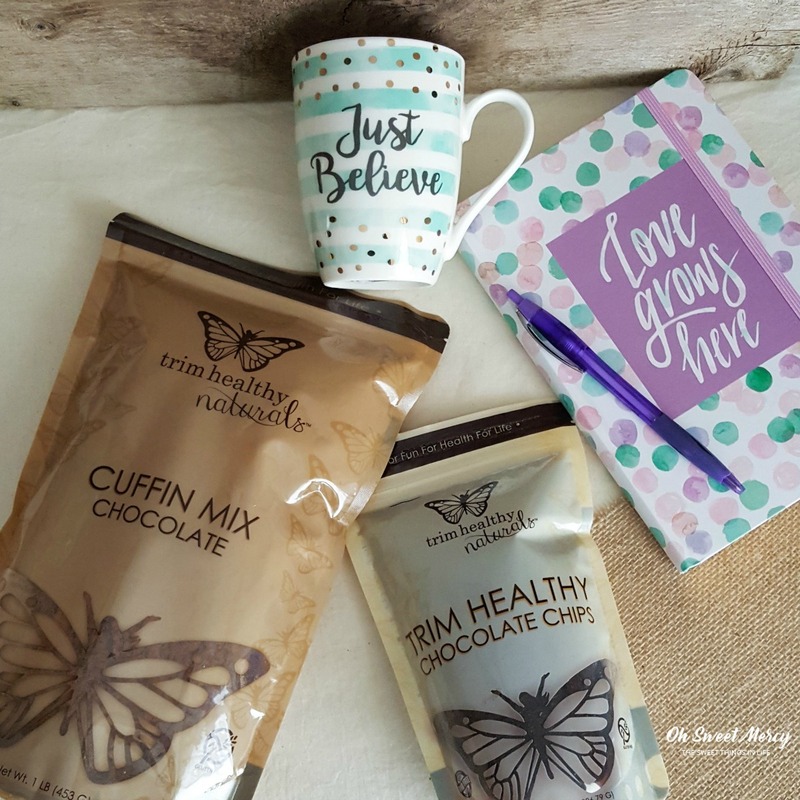 I’m so excited to win the mug – I love bright and cheery things and don’t have a lot of colorful mugs as I don’t drink coffee or tea but love some delicious hot chocolate! I’d keep this at my desk at work. Al of the gifts looks great! I would love to try the sprouted flour. The coffee mug! I love coffee! I love yellow and have the same joy cup as you do! A match would be wonderful, but truly what a blessing to someone this whole package will be! I would love to try the sprouted flours. JOY!!! Love the theme! Joy is my word of the year…again!!! What a lovely collection! i want everything! I really love the cheerful yellow Joy mug for my morning cup of tea! I have made you bread recipe quite a few times. I would love to win the Sprouted Flour for this recipe! The tote bag looks beautiful and I would love to put it to use. Seriously, everything looks awesome! But the flours would be amazing to get. All of the prizes are great! I would love the sprouted corn flour so I could make cornbread. I am excited to try the sprouted flours. I don’t experiment with much with various flours so this would give me a real good reason to! I think all the gifts are amazing! I love sprouted flours and I am in need of a new water bottle. I have a hard time finding sprouted bread in the store ~ it’s gone a lot of the time! 🙁 I would love to try the sprouted flour! Would love to try the sprouted flour! I loved so many and would be thrilled to win anything. I am just starting my thm journey. I’d like to try the flours. I would be so excited about the monogrammed bag as I have never had anything like that monogrammed. All of your gifts are wonderful! What a great giveaway! Thank you for the opportunity to win this! Merry Christmas!! I want to try your recommended sprouted flour! 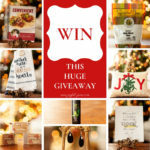 The sprouted flours make me the most excited about this giveaway! How do you choose just one thing?! I love the Monogrammed bag! So excited for all these wonderful giveaways, thank you to all you wonderful bloggers! The joy mug for my coffee in the mornings! i like the JOY Mug because i drink coffee every day and love its positivity. The earrings are beautiful. But then again so is the plate, mug, and bag. I love your whole theme of joy! It’s so hard to choose! I’d have to choose the mug, I collect coffee mugs and it would be a beautiful addition! Seriously it all looks like things I would love. But if I have to choose I guess the bag! Thank you so much for the giveaway. I love the Joy theme & the tote is great — really cheerful! My favorite is the monogram bag! Would love to have that to carry extra stuff! Merry Christmas!!! I love them all! The beautiful mug was what I first noticed. It would be perfect for my morning cup of coffee with heavy cream and collagen. Love your blog! Merry Christmas! I’m excited about it all but especially the sprouted wheat flour! Oh my goodness I would love to try baking with the sprouted flours! I’m excited about the Joy mug. Such a great reminder of how to start your day. 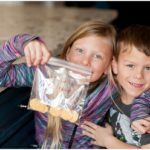 I am just in awe of your giveaway! I have not tried the sprouted items! The purse, cause I just adore purses!!!!! I’ve been wanting to try the sprouted flour. Thank you for the great giveaway! I love the joy mug! I love the water bottle! Thanks for the amazing giveaway! The joy mug, I’m a sucker for cute coffee cups! All the prizes look great! The mug is a favorite – it would be great to drink my morning coffee in. The Lily’s chocolate! I haven’t tried it yet because it isn’t in our budget and I’m a chocoholic! 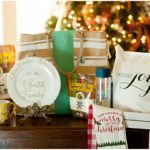 So much to like in this giveaway – tote, mug, plate, flours – everything, but I think my favorite is are the tea towels! I like the blue and white wooden earrings, I’m a sucker for earrings. sprouted white wheat flour! I love baking bread and haven’t found this locally. 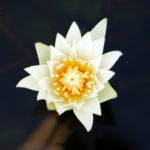 I want to try the Lily’s chocolate. Thanks to the giveaway. Wow, ALL of the items are just amazing and so beautiful! 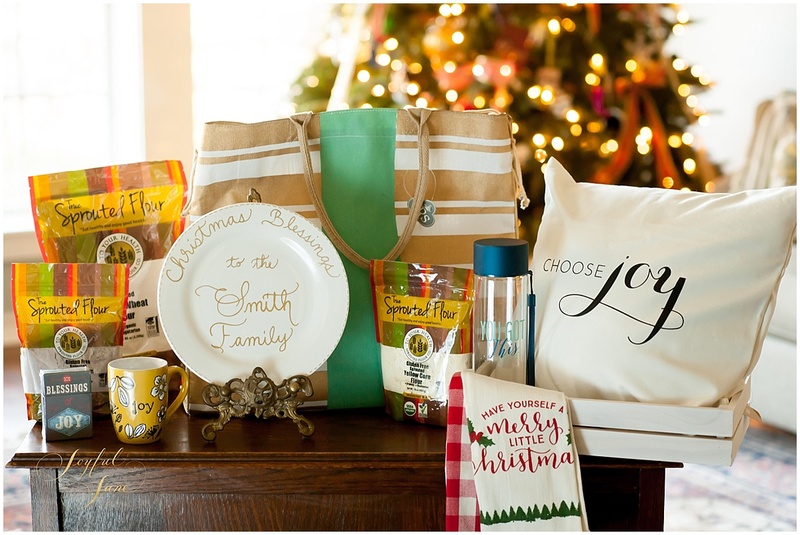 But, I think the thing that caught my eye the most about your giveaway is the “Joy” mug. I think it would remind me often that regardless how things get, I must choose joy and keep my eyes on Jesus. Thank you for the amazing giveaway…this is my first time “meeting” you. I am visiting from Briana’s blog post about the giveaways. God bless you and your family this Christmas season! All of your prizes are so nice, but I’m interested in the sprouted flours. My family is all boys and they love their homemade bread!! I’m excited to try the sprouted flours. I’ve tried to make it myself already and wasn’t very successful. Those earrings are super cute, but I’m such a practical person–I’d have to say the sprouted flour! I’m excited about the sprouted flours! I like all of it! I do t think I can pick just one of them! The flours, the mug, the bag I like it all! The item that stands out to me is Sprouted Purple and Yellow Corn Flour. I like trying new to me baking items, even if they don’t work out, at least I can say I’ve tried it. I’d love to win the sprouted flours and begin to learn to use them! Love the Water bottle mine broke a while back so i really need a new one! but also would love the sprouted flour!! I would love to win some cuffin mix! I’ve not had the funds to try them yet, but I’ve heard great things! What a great giveaway! I’d love to try out the sprouted flours! My favorite item in the giveaway is the tote bag. It’d be perfect to carry my knit/crochet projects in. I would love the monogrammed plate! How cute is that!? I love it all but really love the personalized Christmas plate. We had one years ago for Santa cookies but lost it in a move. I love pillows, so I’d have to say the Choose Joy Pillow is my favorite giveaway item! I love the cheeriness of the mug but would also love to try the sprouted flours!!! I love and make your bread machine sprouted bread recipe, can’t wait to try the new brand of flour! the bag since I can’t have too many. Excited to try the sprouted flour! What a great giveaway! I never win but I am going to try anyway!. Looking forward to trying your bread recipe in the new year! Merry Christmas!! Sprouted flour, because i love bake. But this is such a hard choice! i love the joy theme. All the items are great, but I’m a really sucker for a really cool bag! I would be so excited to try the sprouted white flour! I make bread with the sprouted wheat bread but haven’t tried white! I love all of the “Joy” items! The tote bag looks amazing! I’d love the plate because I love personalized items and the mug is adorable. Thanks for the opportunity to win the give away. I would love the choose Joy pillowcase!! Very good reminder! 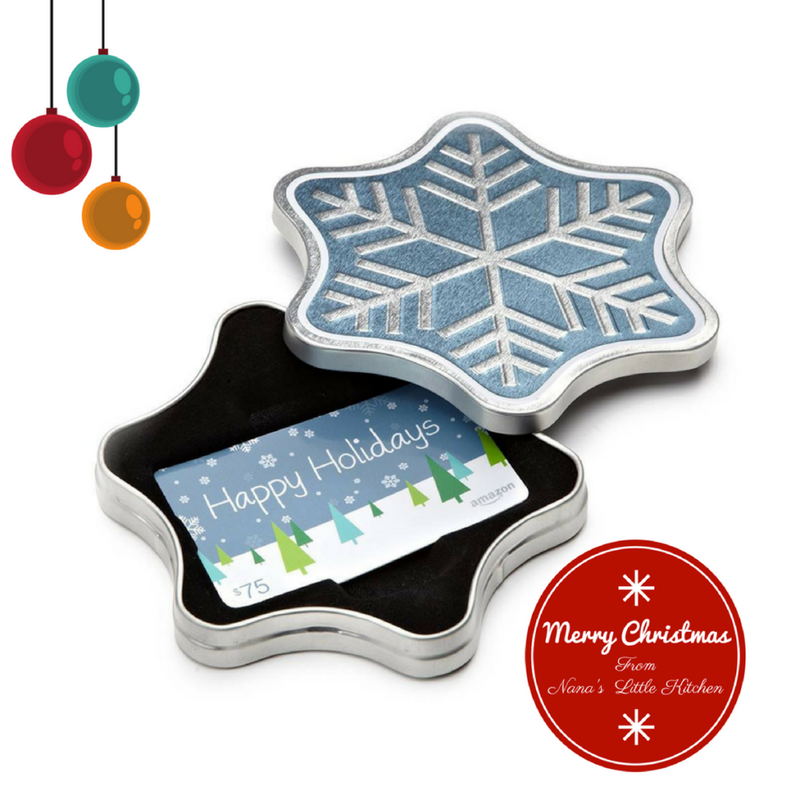 I’m most excited about the Personalized Christmas Plate! I’ve always wanted one of these! It all looks fabulous but I’d really love the blessings encouragement cards! Definitely the sprouted corn flours!!! Sprouted flour and the Christmas plate! I’ve been wanting to use srouted flour for a long time! It is all so cute and fun!!! I want to make the cinnamon rolls!! I love the pillow! Really, all of the prizes are amazing! Thank you for the giveaway! Merry Christmas!! choose joy pillow, i could see it every morning when i make our bed and be reminded! Love to try the sprouted flour but I also love the JOY them! Great blog. Appreciate the meal plans! the bag would be awesome! Gee, how’s a girl to choose just one thing?! The personalized plate is lovely. I would like to try sprouted flour for the first time. 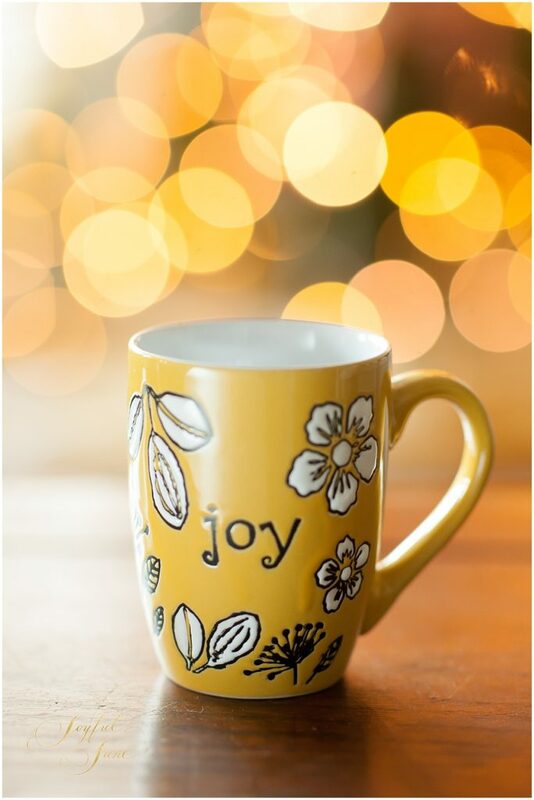 Also, the Joy mug looks like a sunshine way to start any day. Love the joy theme. I have been learning about joy and how it often comes in surprising way for a few years not, so I can truly appreciate this. So many wonderful things.I think the choose joy pillow. It is just a good reminder that joy is achoice. 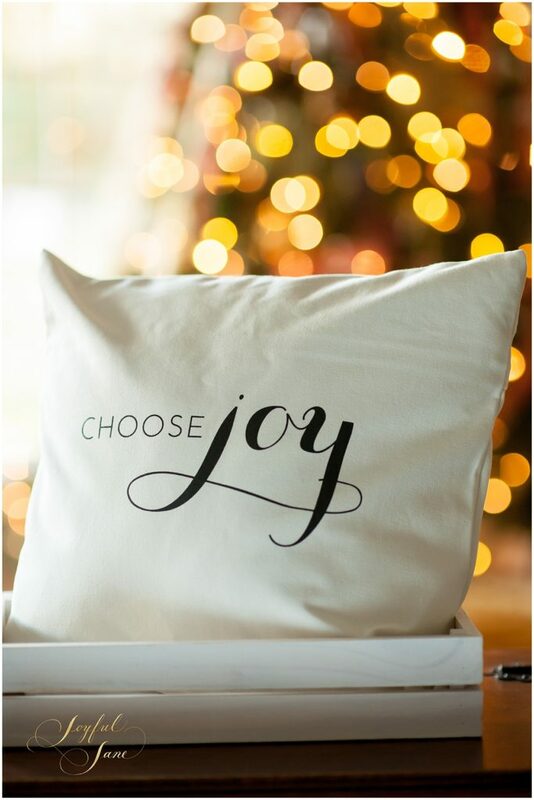 Love the “Choose Joy!” pillow reminder!! I love To Your Health Sprouted flour. Great giveaway! What a fantastic Giveaway!! I would be super excited to win any of it. All the item are amazing. However, I’ve never tried the flours so that would be a new fun thing to try. Thank YOU and Happy Holidays! I discovered your website a few weeks ago but haven’t had time to try any of your recipes. I look forward to doing so after Christmas! 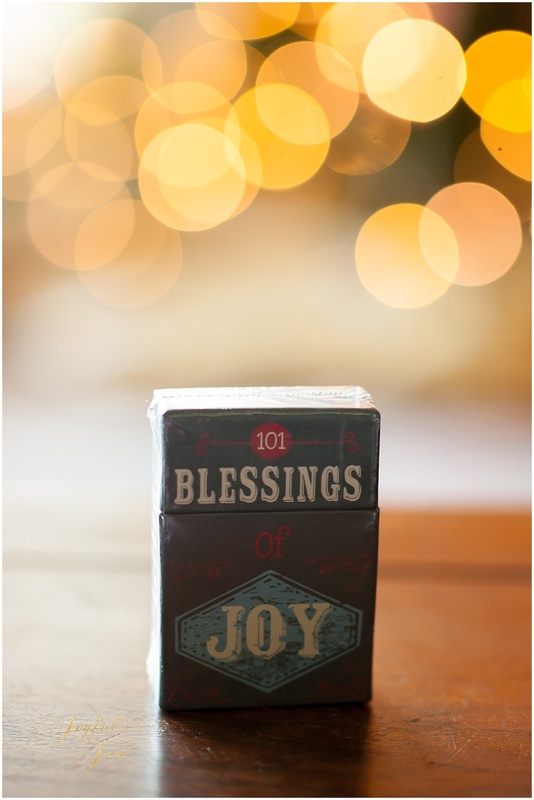 And I love the theme of “joy” on your blog and in your giveaway. That’s an important word at our house, too. In fact, it’s my and my youngest daughter’s middle name, as well as our dog’s name! Everything looks amazing but I am most excited about the sprouted flour! Any and all items would be appreciated!!! 😍 I’d love to win!!! Thanks! I love the inspirational water bottle. I struggle to drink enough water throughout the day. My favorite color is yellow, so the coffee cup is my favorite! 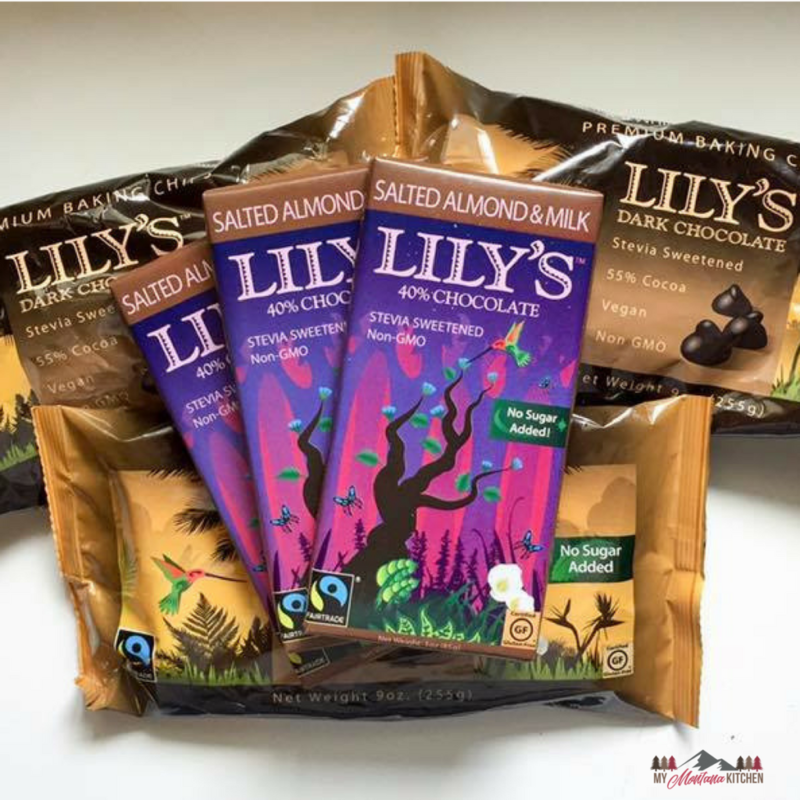 I’d like to try the Lily’s chocolate products. 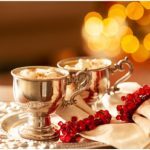 A sweet tooth is especially active this time of year! Merry Christmas. Thanks for the opportunity to win these amazing pieces. I just love it all…hard to pick one thing! Really love the mug and the bag though! The Sprouted Wheat because baking and breads are my weakness and I am learning to change all my recipes over to the healthier sprouted option! The Sprouted Wheat flour is what I’d use first to make my first ever sprouted rolls. I would like the joy mug! I love the pillow. I need that reminder daily! And I’ve never used sprouted corn flour! Can I lump all the joy items into one! They are lovely and encouraging! 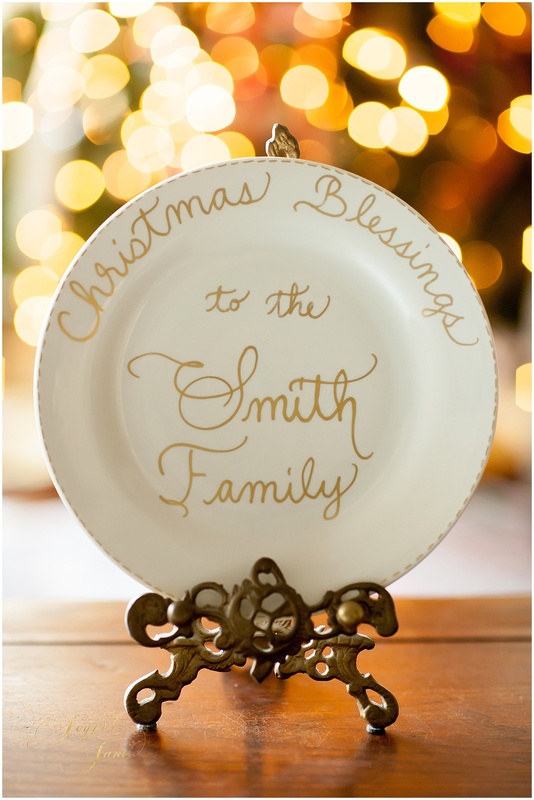 Personalized Christmas Blessings Plate with YOUR last name of choice written by hand in my calligraphy by yours truly… I have always wanted a family item to pass down with our name this is very special I would treasure this and pass it down. It’s all beautiful! I’m most excited to try the sprouted flours! I do t know how to choose my favorite!! I love all the sprouted flours. Yet your inspirational cards and gift items are gorgeous! I can think of so many people I love to give them to. They will lift their spirits. Ty!! I would love to win. I have never used sprouted flour, but I would love to try some home made bread. So many beautiful things! Especially loving that bag! All of the gifts are lovely, but I really want to try the flour! I would love to try the blue corn flower. I enjoy trying new and different things! Thanks for this giveaway! The lovely print at the end is my favorite. And i am intrigued by the flours you listed. I love the choose joy pillow. It is so simple yet meaningful. The entire give away is just beautiful. I would love to try the sprouted flours in some of the recipes you shared. I am very interested in trying the blue corn flour. I MISS cornbread. Wonder if this will satisfy that one? Love it all but the tote bag is especially cute! The calligraphy plate, it is beautiful. But everything looks amazing. I love bags so that is probably my favorite but everything is amazing! Thanks! I love it all, but would be most excited about the sprouted flours! All of the products look amazing! 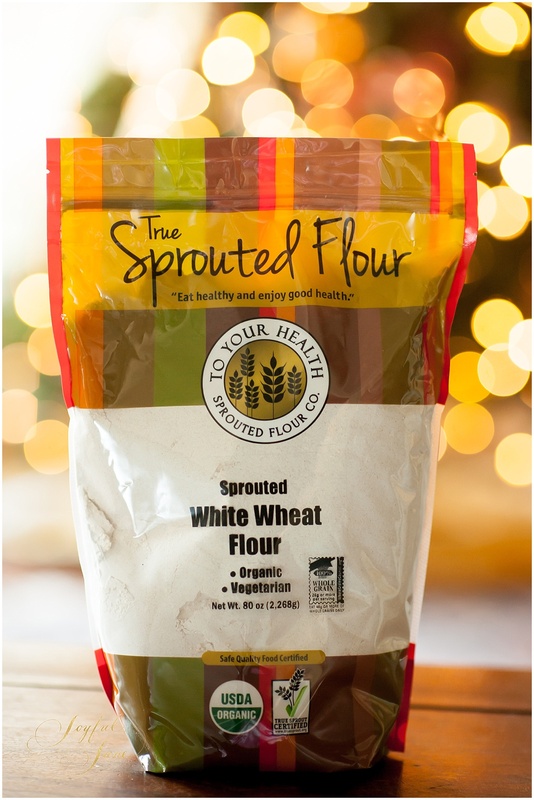 I’d really like to try the sprouted white whole wheat flour! While all the items are beautiful, the cards really jumped out. I think that giving a card is such a personal and thoughtful thing. Blessing others with encouraging words. I really love both the pillow and the mug the best. It’s really hard to choose, but probably the sprouted flour. I love homemade bread. Thanks! I would adore those blue and white earings!! Every. Single. Item. 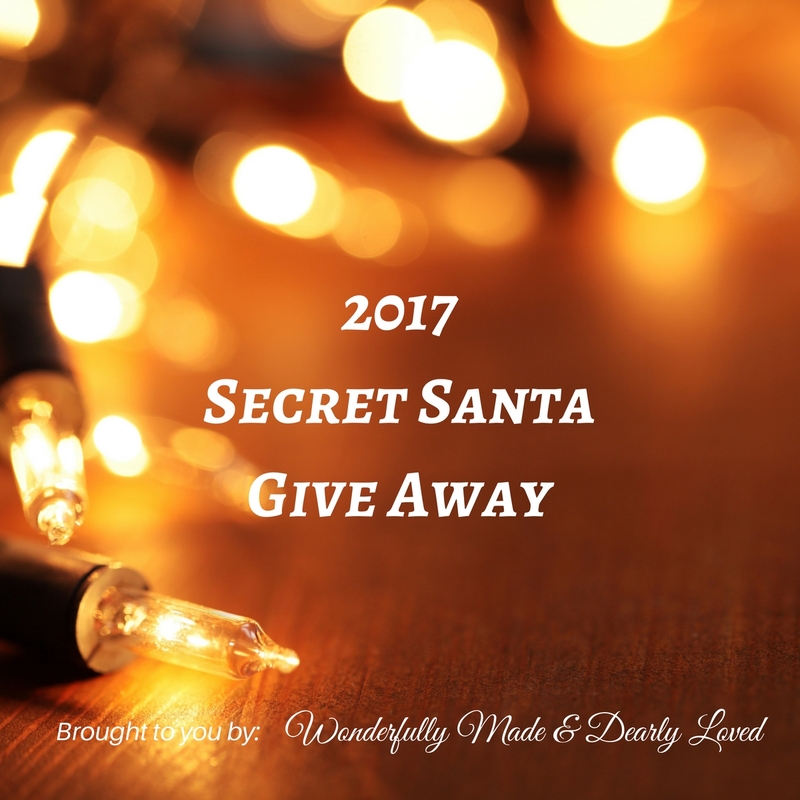 is special…Such a great giveaway! Thank you for offering it! The print, mug, bag, and all the new recipes I could try with the flours. I would love to make my own sprouted wheat bread..would love the flour! It’s all WONDERFUL, but I really love the “Choose Joy” pillow cover! Love, love, love the bag and mug!!!! I love all your gifts – very tasteful. I’d like the water bottle as a gift for my daughter – she says that a lot. It all looks great! But I would say the sprouted flours or the blessings cards. The sprouted flour!!! I’ve tried making my own but the baked items don’t turn out light at all!! I’m excited about the sprouted flour so I can bake stuff for my husband and son. I’m having a hard time choosing just one thing in the giveaway that is my favorite. I think it’s a toss up between the monogrammed bag and the tea towels. The bag is really cute, and I love anything Christmasy. I really love the tea towels! Everything looks AMAZING but I have always wanted to try sprouted flour! I’d love the flour, but the earrings and bag are calling to me too! Love all of it! You have a knack for simple elegance…. I love the JOY mug! Thanks for a great giveaway! I would choose the sprouted corn flour. My husband misses cornbread. I could make him some and he would be happy. I really like the joy mug! Sprouted flour! All of it! Love tote bags and water bottles but all the items are wonderful! Would love to try the sprouted flours. Love everything in the giveaway but especially love the blue corn flour. Would make some fun pancakes! Definitely the THM chocolate chips and the Joy mug, it’s gorgeous! All of it? 🙂 No seriously, all of it!!! <3 But if I HAVE to choose one thing, the mug. 🙂 What a beautiful reminder to choose Joy! I love it all!!! Especially loving the joy mug!!! I love home-made sprouted grain bread, so my favorite part of the giveaway is the sprouted flour. And it would be fun to try out the sprouted corn flours too; I’ve never used those! I am so excited to have found your blog! I LOVE LOVE all of your favorite things! Most excited for the personalized Christmas Blessings plate. The personalized monogram bag and the water bottle. Sprouted flour, i’m excited to bake with it. Most excited about the sprouted flour. I LOVE the Choose Joy pillow. It has been a rough season and we need the reminders! So hard to choose, but I’d like to try the flour. Thanks! Everything is lovely, but I realllllly want the sprouted corn flours. I’ve been eying them for a while! The water bottle. I LOVE water bottles…my husband says I have an addiction to them. 😉 But…I find I stay hydrated more easily when I have a cute/fun bottle from which to drink my water! I would be excited to have the plate. What a wonderful personalized item. I know I won’t win (I never do) but it is fun to enter. The ‘Choose Joy’ pillow!! When life gets tough, I love to remember that I dont need to give into frustration and become weary, but instead, in all circumstances, I can choose the joy of the Lord! Love the purse and mug! Thanks for doing this giveaway. I love the Choose Joy Pillow! All the things! Haha! But I would love to try the sprouted flours. 101 blessings – would be great to have something quick each day! My favorite items here are the sprouted flours! Since or family does a lot of travel, sprouting or own is virtually impossible. Uggg, phone autocorrected ‘our’ to ‘or’! Love the choose joy pillow!! !so darling! N generous..all of it!! My favorite item is the purse. Mostly because I have a large hole in my favorite one. Lol. There are so many nice things in this giveaway! How can I choose just one? 🙂I really like the water bottle, and the “Choose Joy” pillow case! A good reminder as we go to bed each night, and wake up to a new day! Wow, it’s tough to choose a favorite. I’ve always thought that we could choose joy, because happiness is only a feeling. So all your wonderful joy items are such a great reminder of that to me. I think if I had to choose, though, I’d choose the mug, since I’m always cold. It’s always so nice to fill it with something warm! I’m excited about the mug, tote, and different flours. I’ve only experimented with coconut and almond flours, so I’d be very interest in trying to trying these! Thanks for the opportunity! Wow! What an amazing giveaway! Thank you for the chance to win! My favorite item is probably the scripture print. It is beautiful, and an important reminder to always be grateful for God’s love. The sprouted corn looks interesting. I’ve never tried it before. Excited to win the sprouted floor!!! Love the sprouted wheat flour love to bake. All of the items are fantastic. It’s hard to choose, but I think my favorite item in the giveaway is the sprouted flour! I would love the choose joy pillow cover. It’s a great daily reminder. I’m excited to try the sprouted flour… but the bag and coffee cup is pretty nice. I love cinnamon rolls and sprouted flour let’s me enjoy them ! The pillow and sprouted flour! What a wonderful give away – I’m loving your ‘Joyful’ theme! I’ve never heard of some of these products but I love them all by the looks of them! I like the tote bag and sprouted flour. Anything to do with Joy because I need daily reminders of joy in my life! Thank you for the very nice giveaway. So many great things. I like the glass bottle. I think I would be most excited about the pretty print and the mug. Everything is great so it is hard to pick. I would love to try that sprouted flour! What a beautiful, joy-filled giveaway! All your hand-made gifts are stunning! I’d love to try the sprouted flours!! I’ve toyed with the idea of making my own because it’s so expensive to buy. Oh, how fun it would be to win 😀! I don’t really know how to decide which item is my favorite! I would be most excited to try the sprouted flours, but I love that pillow!!! And all the personalized items!!! There is so much in this giveaway, it’s hard to choose a favorite. I especially love the tote bag and the JOY mug. If I could say everything I would! 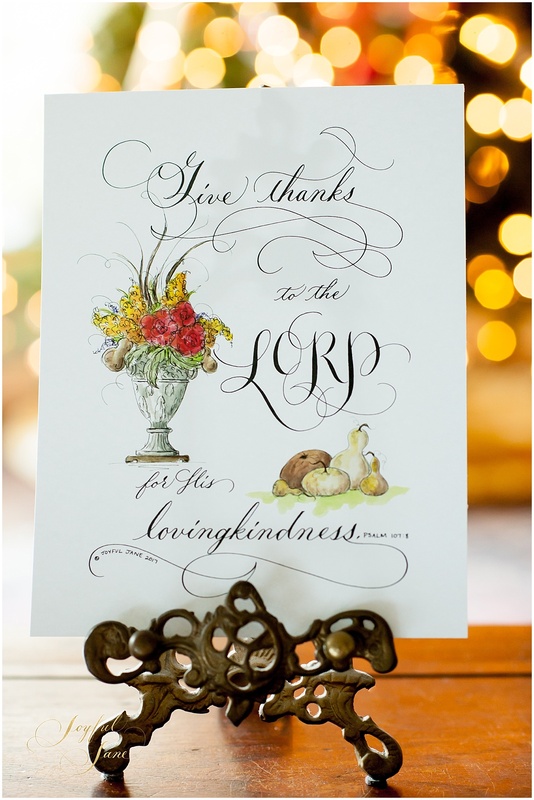 However, if I had had to choose one thing it would most likely be the beautiful calligraphy plate or the blessing cards. It’s so hard to choose- there are so many cute and wonderful things. I really love the mug because I love yellow. And I had no idea that there was sprouted flour available- those cinnamon rolls look delicious! Love your blog! I need to try that white wheat sprouted flour. The sprouted flour would help my baking so much! But I also Looooovve that tote and the choose joy pillow cover! Thanks for a great giveaway! My name is Joy and I love the Joy pillow cover. Joy is a choice! what a terrific assortment of goodies- i don’t think i could choose just one favorite! they all look good…. Would love to try the sprouted flours! The sprouted flours, excited about them because I miss good bread. Love your website! Gorgeous giveaway items!! It’s all so beautiful. I’ve never tried sprouted corn flour before! i am most excited about the sprouted flours! Choose Joy pillow! A favorite reminder!! It is really hard to choose, but probably the sprouted flours! I’ve been wanted to try sprouted flour. Your recipes using it look so good. I like them all but I guess any of the sprouted flours! The Joy Mug. It would bring me joy all day long as I drink my coffee and tea! Your calligraphy is beautiful! Anything with that on it would be great! Its hard to choose only one thing from your giveaway but if I had to choose it would be the monogramed tote bag because I have alot of totes to use for my crochet projects and this one looks like a nice size for me to use for that purpose thanks for the chance to win this. I’d love the sprouted flours! And the mug! Sprouted flour. I’ve never used it before! Awesome giveaway! I would love to try any of the sprouted flours!! Oh what a generous giveaway! 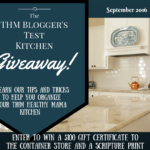 I’d love to win your Scripture print and Briana’s Cookbook! Everything looks great! But, the purse and earrings are especially calling my name! You do such great giveaways! Love the pillow! I too have the choose joy shirt. I often need to be reminded to choose joy! I really like the tea towels. They are lovely. I excited to try the sprouted flours. So many possibilities. Thank you so much! This is a neat giveaway. 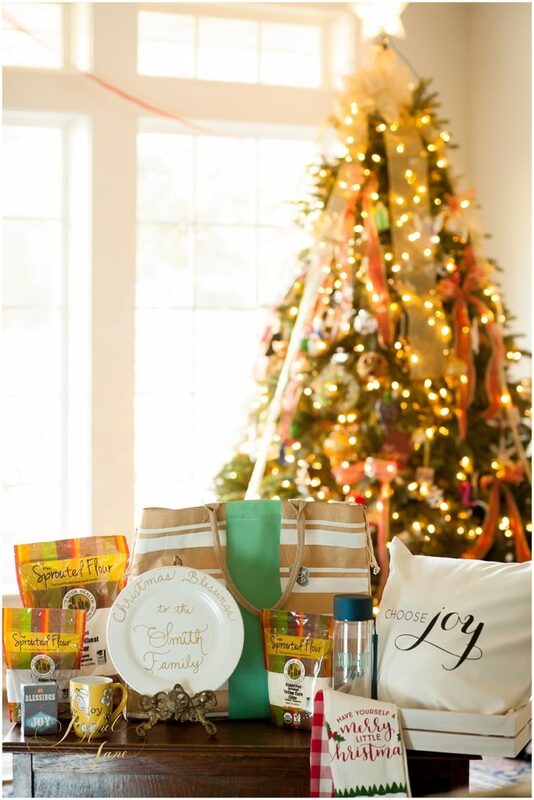 Love the joy reminder items and spirited flours. I’d love any of them!! They are all great! I have to try sprouted corn flour! I’m excited to try the sprouted flours. Didn’t know there were so many kinds. Wow, this is an wonderful giveaway, thank you! I would love the earrings they are my style, I love the joy mug and the inspirational cards. I have choose Joy all over my house. I love water bottles! I would also love to try the sprouted flours. Thank you for being part of this giveaway! All your items look wonderful, thank you for doing the giveaway. Any of the sprouted flours would be helpful for sure as I’m just starting this journey. I’d be excited to try the sprouted corn flours! It all looks so beautiful! I’m very excited for the Sprouted flours. I could really use a new bag, so the monogrammed tote is my favorite! I would like the pillow or mug. The monogrammed bag is my favorite thing; I love the gold and turquoise!! 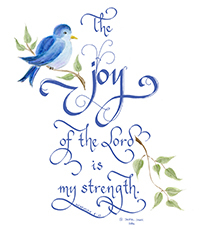 I would love to win the scripture print, most beautiful to display! Thanks for the opportunity to win! I’d love to try the sprouted flours. I’m excited about the personalized bag. It looks great. Love the Joy theme. Last year was a difficult one for Us. My home was flooded with 6 feet of water my Mom away 5 days before Christmas . Things have improved this Christmas! Ready to start baking again would love to try sprouted flours!! It would be a huge blessing to receive this! It’s a hard choice because everything is awesome, but I’m very excited about the sprouted flour. I love to bake and I’ve not tried any of the sprouted flour since following the THM lifestyle. This could be life changing. I’m a sucker for a good water bottle! What a fun and wonderful prize! I would be so excited to use all of these goodies especially the baking goods! Thanks! Merry Christmas! The sprouted flours sound great! I love to bake my own bread. What a great assortment of goodies! I’d like to bake with sprouted flour. I really like the tote bag because I am always trying to juggle too much of mine and my children’s things and I need a great tote bag. I’m looking forward if I win,to the sprouted corn flours and the scripture print! Where I live I haven’t been able to find the sprouted flours and I have been wanting them and I just think that the scripture print would be so neat to have and display in the home! I have been living THM for two years and have never used the sprouted flours. It just might open a whole new world for us 🙂 Plus the bag is just way to pretty, amongst all the other cute items! I really want to try making sprouted breads! So much to love here. Love that you are homeschooling 8 children. Love your hand made gifts. And I am so excited to think there is sprouted corn flour….who knew? Thanks. I like the tote – but I would also like to try to make anything sprouted! Everything is so beautiful! I would love the true sprouted corn flours, it would be a game changer in our family who loves making homemade tortillas and tamales. 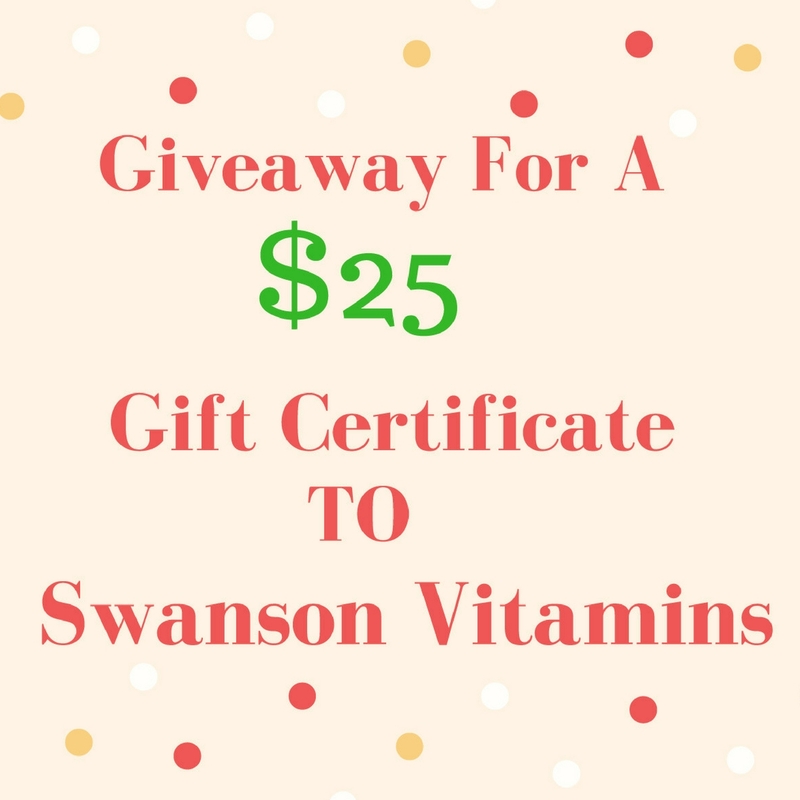 This is an amazing giveaway! And you can never have too many reminders that JOY is a choice 🙂 Thanks SO much! I love the Choose Joy pillow cover, and the sprouted flours would be fun to try! All those look so great to share and keep! Thanks so much! I’d really like to try the sprouted flours. But then I never splurge on cute decorative items so the pillow and plate and towels would be fun. All the items are great! 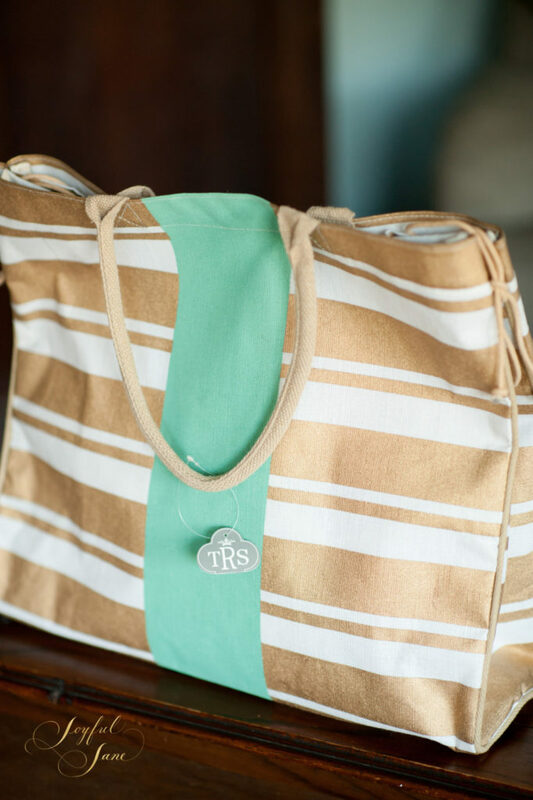 I really love the Monogrammed Gold, White and Turquoise Bag! Thanks for the giveaway! Your giveaway looks awesome! It’s hard to pick just one, they are all great! Torn between the bag, pillow, and tea towels. The pillow cover and towels for our new home and the bag v/c I’m a bag junkie. Lol! I would love any of it but I’ve never had the Lily’s chocolate and I’ve not tried sprouted flour so those are 2 big ones. Love it all! Would love to try the sprouted flour! Merry Christmas! I love the yellow Joy mug! It’s cheery and serves as a good reminder as you start your morning. I am most excited about the sprouted flour! I would love to use it for baking! Your sprouted bread recipe is my fav!!! Sadly, I’m having a lot of trouble finding sprouted flour that isn’t crazy expensive. It would be such a blessing to win this bundle! Along with all the others, I too am excited about the sprouted flour. They tend to be dear and I hesitate to buy them without knowing whether or not I will enjoy the product. <3 Thank you for offering them up on your giveaway! I would love to win the sprouted flour as we have a hard time finding it locally where I live. I love everything but I would have to say my favorite is the bag. Super cute! Cool giveaway! I love your theme! Would love to try the sprouted grains to make bread! I would be happy to receive any of the giveaway items, but I’ve always wanted to try out that brand of sprouted flour! I love the sprouted flours! I am excited about the flours! We all need more JOY in our lives. So many wonderful things, but I’m really excited to try sprouted flour. I haven’t used it yet, and have wanted to. I love the tote and would love to carry it, and everything else you are giving away! Merry Christmas!! I have been wanting to make my Mother-in-law’s Christmas bread with sprouted flour! Choose Joy has been my motto since last year when my dad died. So everything about this giveaway is right up my alley. Thank you for hosting it! I would love to win the sprouted flour to make your bread recipes. The joy mug. Joy is my word this year and I use mugs a lot. The Sprouted Whole Wheat flour since I haven’t tried that yet. The sprouted flours would be great to try! I love ALL the things that say JOY! That’s my middle name… and my daughter’s… and my granddaughter’s!!! We’re spreading the JOY all around! So many great products! I’d love to eat some sprouted treats while drinking coffee from that mug! Everything looks great, especially the inspiration cards!! What a beautiful give-away you’ve created. Thanks! 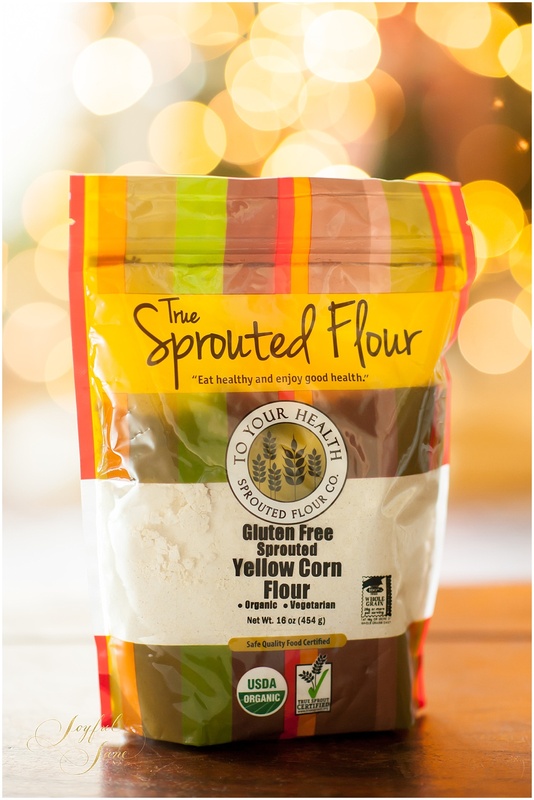 Would love to win gluten free sprouted flours. I’ve never seen these before and would love to try them. This would be a lovely package to win! The choose joy pillow would be very fitting for the journey i am. All of the sprouted flours seem like they’d be wonderful to bake with!